Curiosity didn't kill the 'cat. 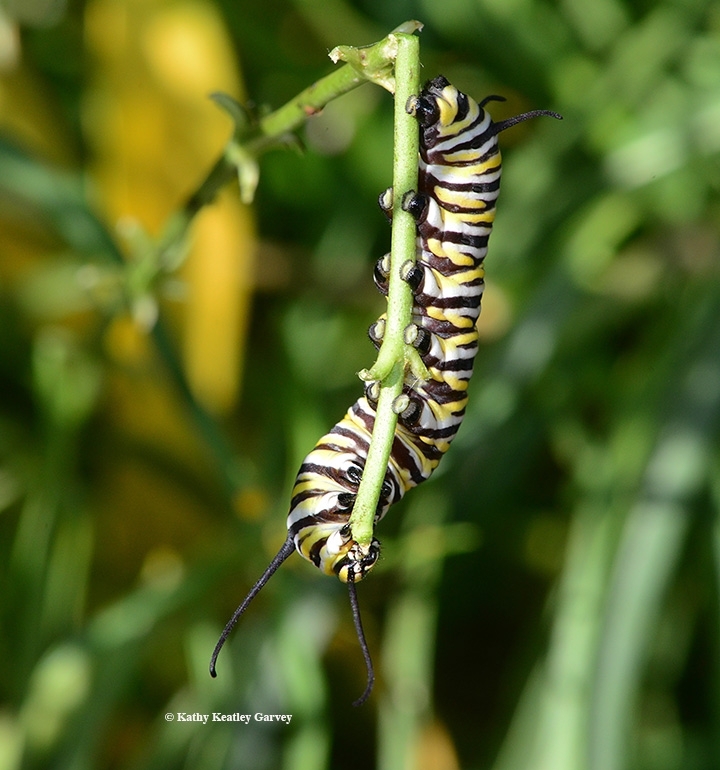 We were delighted to find 10 monarch caterpillars (the first of the year!) 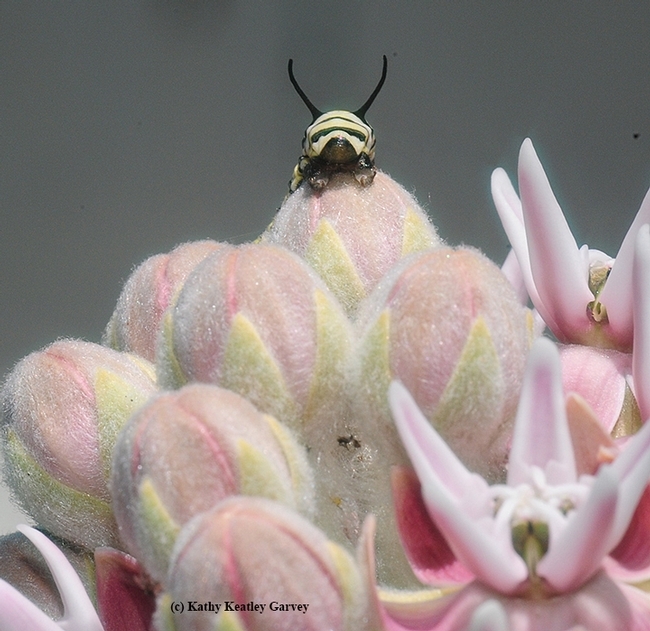 on our narrowleaf milkweed a couple of weeks ago in our Vacaville pollinator garden--but not so delighted to see what happened to one of them. We tucked the 10 'cats in two Bohart Museum of Entomology butterfly habitats: six in the larger-sized one, and four in the medium-sized one. 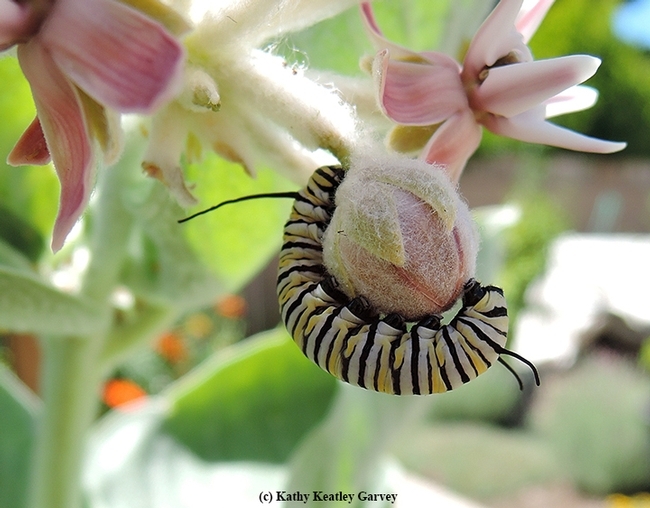 We filled each with lots of milkweed so they'd have plenty to eat and plenty of room to grow. They ate. They ate. And they ate some more. 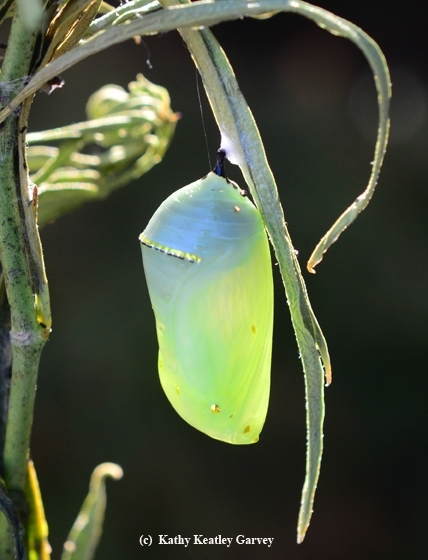 They began to pupate and form those gorgeous jade green chrysalids rimmed with gold. All was well and good except for what occurred next in the medium-sized habitat. One of the 'cats spun its silklike mat, attaching itself to the top of the netted habitat. 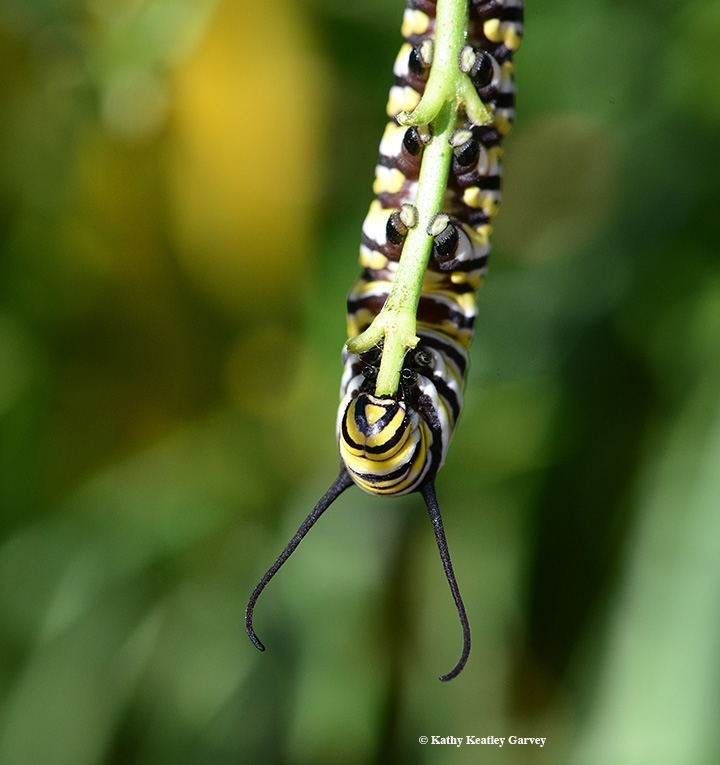 It was j'ing (or hanging upside down in a J-shape) and beginning to spin rapidly to form a chrysalis. Two of its siblings were already chrysalids. Now, j'ing is a vulnerable stage in the wild. 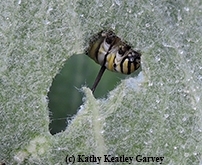 Parasitoids, such as tachinid flies and Trichogramma wasps, can and do lay their eggs in them. And they're also, in this helpless state, fair game for such predators as birds. But this was a "safe environment," right? Wrong. Meanwhile, its sibling remains quite dead, never completing the metamorphosis we expected it to do. No, the stuffed turkey didn't slip out of the oven and fall on the floor. Nor did the pumpkin pie turn another shade of orange. Some unexpected guests arrived--four to be exact. 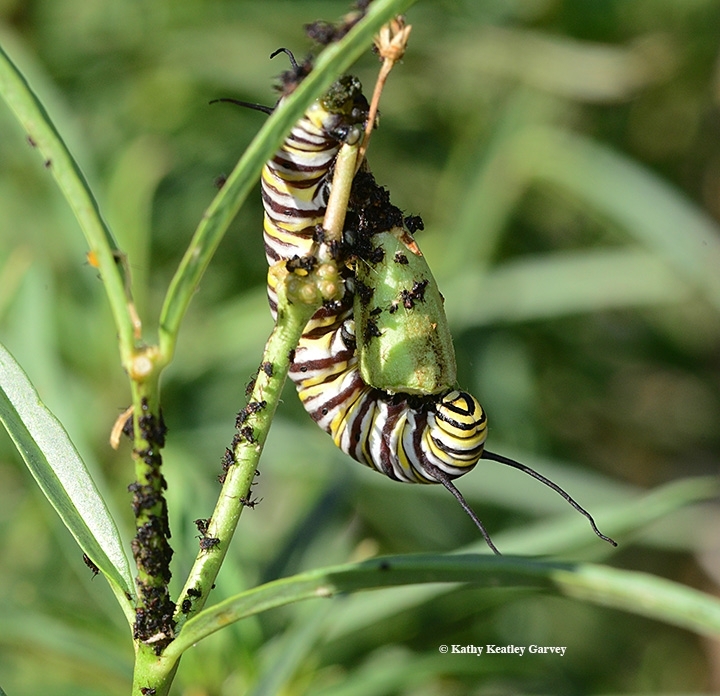 That's the number of monarch caterpillars we found on our tropical milkweed (Asclepia curassavida) in our pollinator garden in Vacaville, Calif.
Just when we thought our small-scale conservation project of rearing and releasing monarchs is all over 'til next year, it's not. Our season total of 54 monarchs is likely to increase. 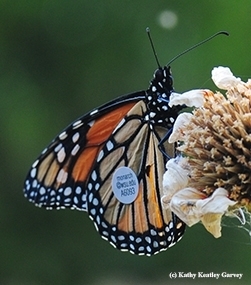 "This is really far inland for such late breeding," said butterfly expert Art Shapiro, distinguished professor of evolution and ecology who has been studying Central California butterflies for more than four decades and maintains a website on his work and monitoring observations. "Winter breeding has been occurring near the coast for some years now, but I recall no records this late east of the East Bay. October, yes. November? 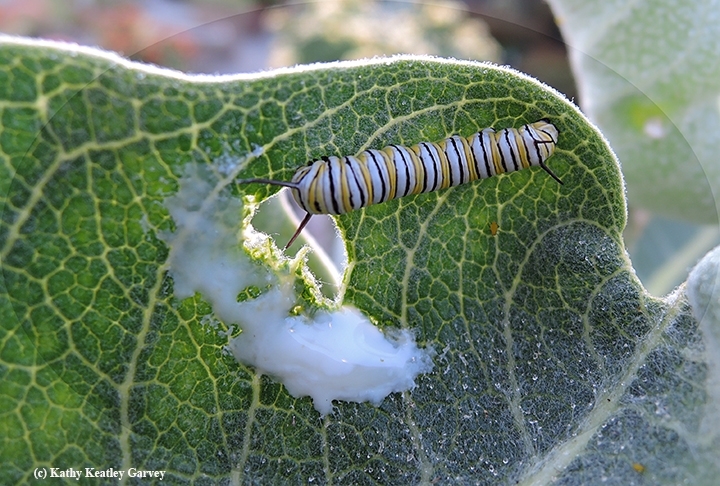 We really need to understand the physiology and genetics of non-repro-diapausing winter monarchs!" "We've been seeing evidence of a significant fall window of opportunity for larval monarch development for a few years now, which seems different than the historical pattern," noted Louie Yang, associate professor of entomology, UC Davis Department of Entomology and Nematology. "I've wondered if these are returning migrants that are breaking reproductive diapause when they encounter warm conditions in the Valley. I've mostly seen them on late season native milkweeds, but of course the tropical milkweeds are even more persistent." 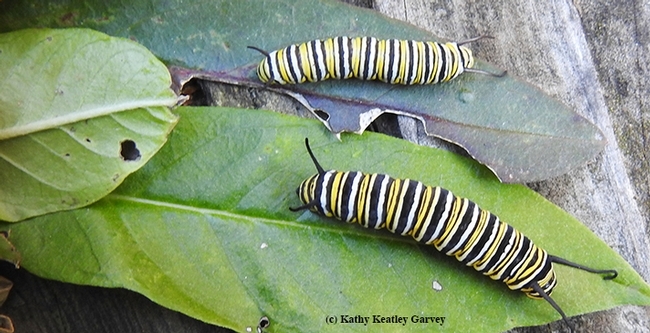 Meanwhile, the 12 monarchs are the center of attention--well, at least a corner of attention--on our kitchen counter. Our setup: two mesh, zippered containers from the Bohart Museum of Entomology, UC Davis; and four narrow-necked, flat-bottomed bottles filled with water and milkweed stems. The monarch caterpillars are doing what monarch caterpillars do best--and what folks around the Thanksgiving dinner table do best. Eat. 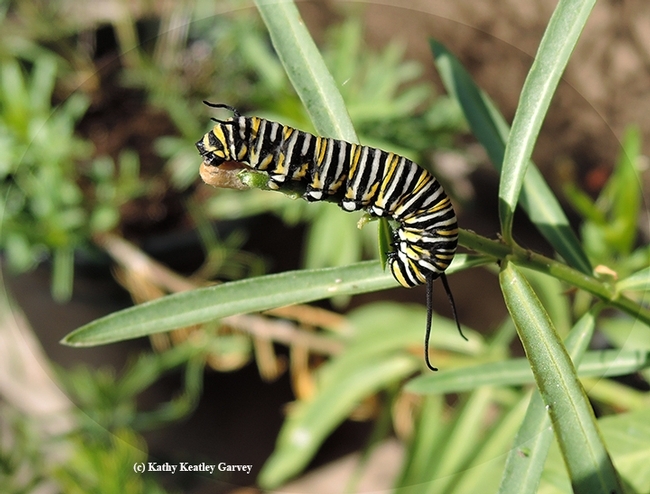 Monarch butterflies are migrating now, but we're still finding a few caterpillars in our pollinator garden in Vacaville, Calif.
We recently plucked off five caterpillars from our milkweed plants (our game plan is protect them from California scrub jays and other birds, tachinid flies, wasps and the protozoan parasite, Ophryocystis elektroscirrha or OE, for short). These are the last 'cats of the season. Ours is a small-scale conservation project. Our goal is to reach 50 by the end of the season. 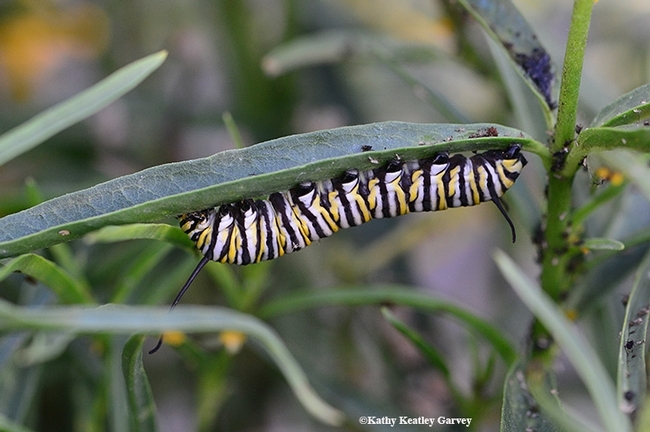 We're on track to do our small part for the declining monarch population. 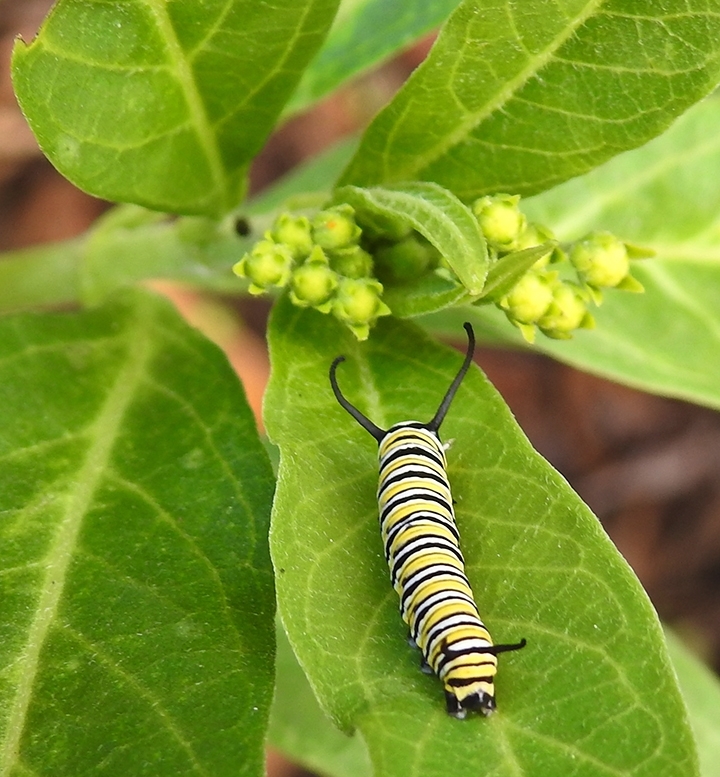 Plant milkweed (the host plant of monarchs), plant nectar-rich flowers such as Mexican sunflower (Tithonia), butterfly bush (Buddleia) and Lantana, and Danaus plexippus will come. Weiford works inside the French Administration Building, named for former president C. Clement French. When I joined the Daily Evergreen news staff--way back when!--I used to interview Dr. French. 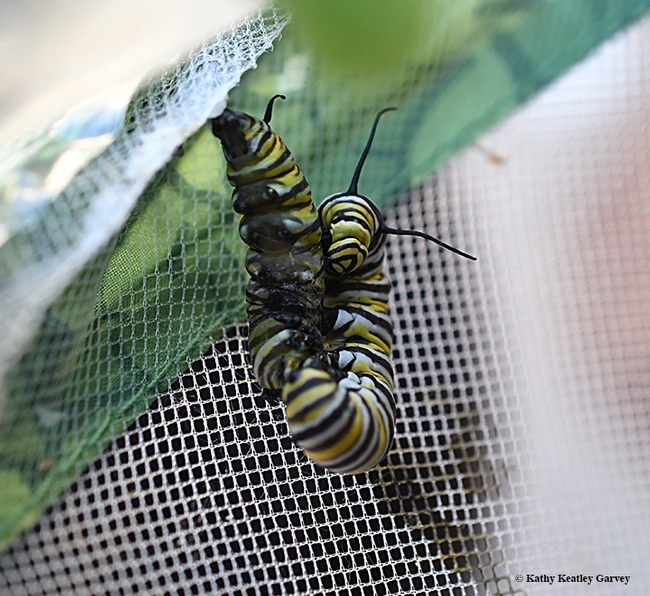 And it became even smaller when the WSU-tagged monarch (monarch@wsu.edu), part of WSU entomologist David James' research program, stopped by for a visit. It was reared by citizen scientist Steve Johnson of Ashland, and tagged and released on Sunday, Aug. 28. "So, assuming it didn't travel much on the day you saw it, it flew 285 miles in 7 days or about 40.7 miles per day," James said. "Pretty amazing." Now, with any luck--well, lots of luck--Steve Johnson's progeny has made its way to an overwintering colony in Santa Cruz or Pacific Grove. And with any more luck, we'll be adding five more to the overwintering site. Sometimes caregivers, including grandparents, aunts, uncles, cousins and neighbors, take photos of babies to show "proof of life." They post them for the parents to see, admire and confirm. It's delightful to see images of your offspring while you're on vacation, on a business trip, or just out and about. 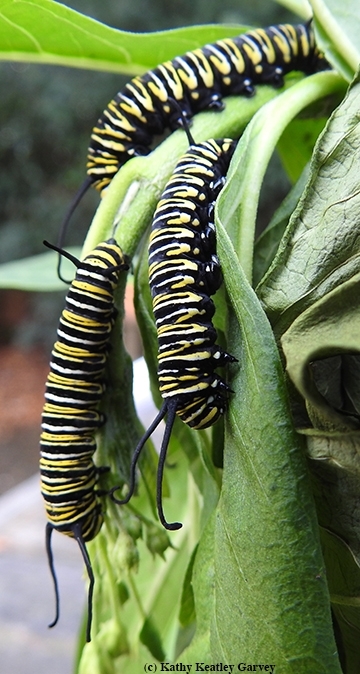 Same with monarch caterpillars. "Monarch Moms" and "Monarch Dads" take "proof-of-life" photos. 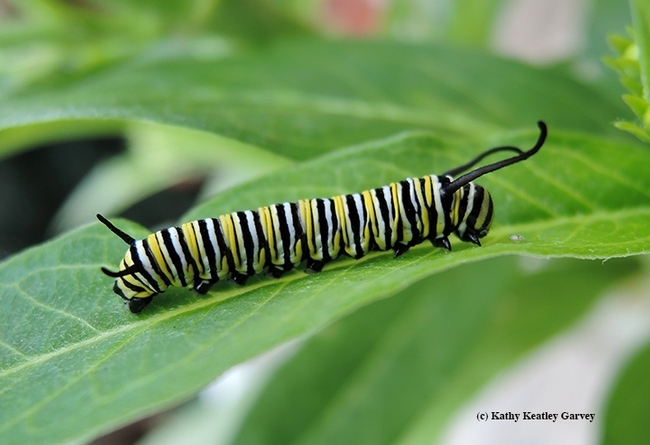 Often we'll see a hungry monarch caterpillar chomping and chewing and gorging on milkweed. It's a pretty sight, these chunky white caterpillars banded in yellow and black doing what they do best--eating. 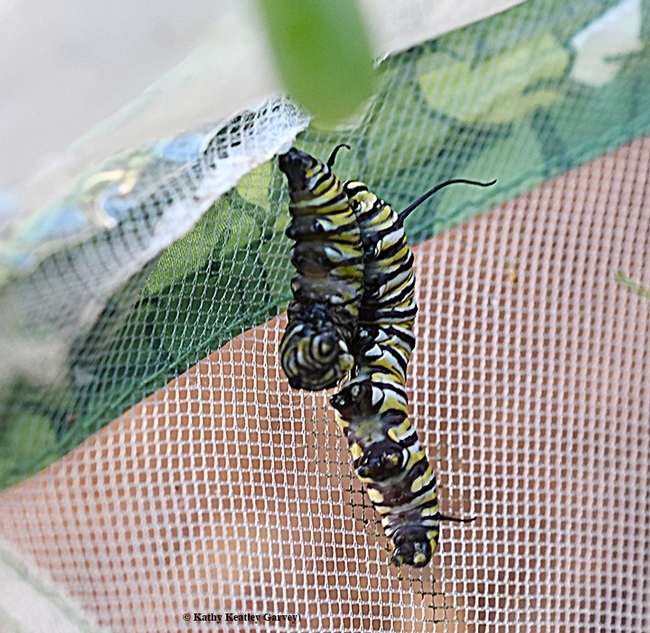 Some day they'll form a "J" and then a jade-green chrysalis rimmed with gold. And then--voila!--an adult monarch will eclose. Some day, but maybe not. A predator may nail them. We recently noticed a Missing-in-Action caterpillar from our showy milkweed, Asciepias speciosa, and a quite contented Western scrub jay looking like the cat that ate the canary, or the scrub jay that ate the 'cat. Note that the jays nest in our trees, and to nourish them, we feed them seeds year-around in the birdfeeder. The birdfeeder, however, happens to be located right next to the 8-foot showy milkweed where monarchs lay their eggs. Jays apparently like a varied diet. Like a fat juicy worm (to them). Yum? Not yum. It does not taste good. 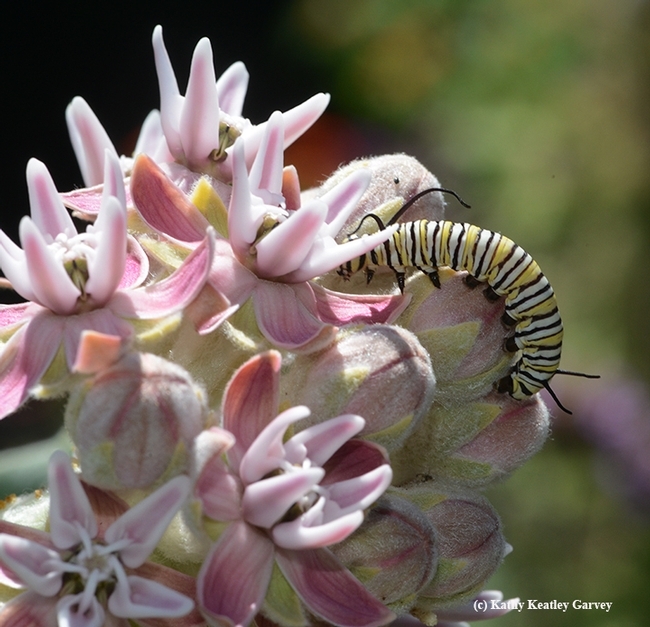 Species in the genus Asclepias produce the toxic cardiac glycosides and this helps protect the caterpillars from predators. Although they don't taste good, they will still eat a few. 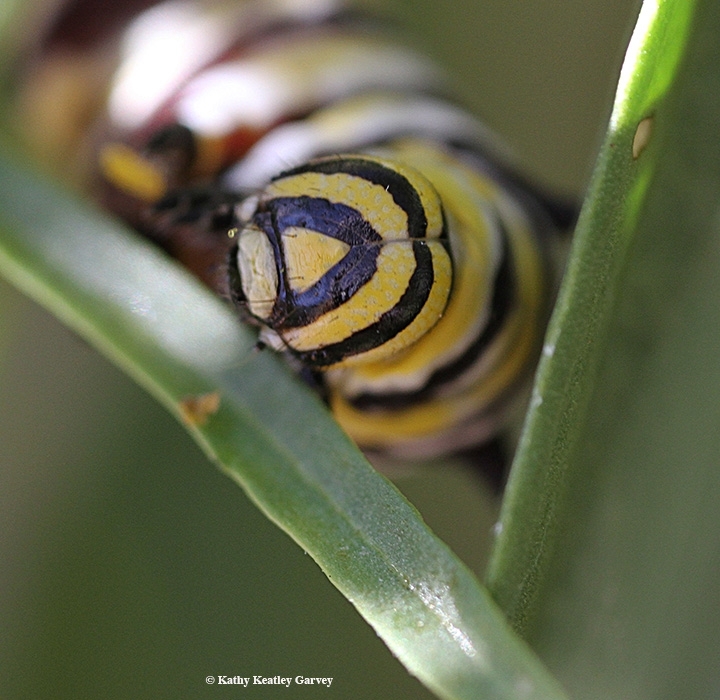 The photos below are proof of life of one hungry, thriving caterpillar. The next day? Gone. It became a bird's dinner. But not its sibling caterpillar. 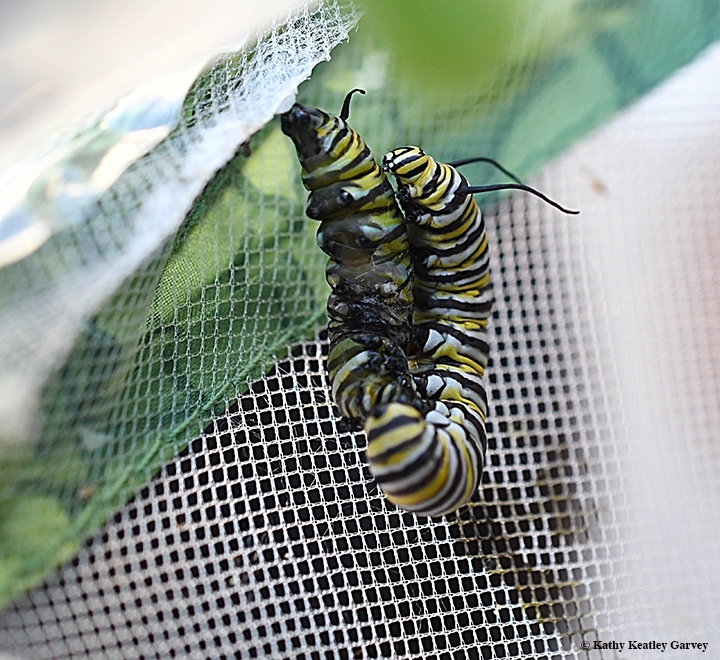 We rescued it and fed it and watched it form a chrysalis. 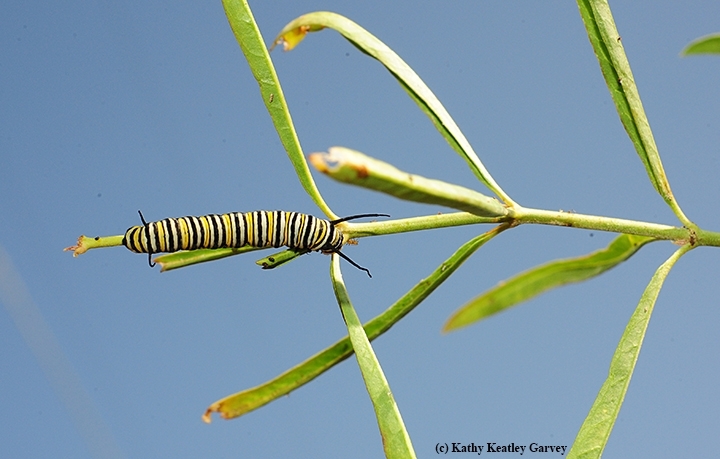 Soon an adult monarch butterfly wlll eclose. This one will be "proof of life."